ChillyFruit a division of YouNeedADrink.com Nationwide frozen drink equipment leasing and financing programs with low monthly payments, low start up costs and tasty slush smoothie products for Kids, Parents, Churches, Family Fun Centers, Sporting Events, Schools, Convenience Stores, Restaurants, Bars and anywhere that frozen slush, smoothie, margarita, daiquiri, granita and slushees are served. ChillyFruit®* is the Profitable and tasty slush smoothie frozen fruit drink and Frozen Drink Equipment leasing solution! Slush Machine leasing programs, Profit Programs and Slush/Smoothie & Cocktail bases and mix products that are perfect for businesses who serve Kids and Adults! We have frozen granita drink mixes in flavors with 20% Fruit Juice and other flavors that taste great and will help you make money. We represent Bunn Frozen Drink Equipment and other manufacturers with affordable leasing and financing to help get your company started quickly and affordably. Low monthly payments. Top quality products. Excellent Customer Service. Profit Programs that are perfect for churches, fundraisers, schools, convenience stores, PTA, PTO events, sporting events, family fun centers, and other fun activities where frozen drinks are served. In addition, they can be used at adult functions to make tasty frozen cocktails so they are perfect for bars and restaurants as a tasty and profitable frozen cocktail mix. Nothing compares to the fresh taste, versatility and commercial appeal of ChillyFruit®. Are you a new business owner and have a new start-up business venture like a restaurant, family fun center, sporting event center, skating rink, catering company, daiquiri bar, convenience store, tanning salon, concession stand, vending business, coffee shop, fundraising business, pub, dance club or other business that would benefit from the high profit that frozen drinks can provide? Are you long on ideas for your new business, but short on start-up cash? Are you a School Cafeteria Manager who has been looking for more profit to add to your school cafeteria program? Are you a School Nutrition Director who has seen your County's Cafeteria A La Carte Sales slow down? Are you on the fundraising committee for your child's ball club, sports program or other organization that could use more fundraising ideas? Are you a parent involved in your children's PTA, PTO or other Parent Teacher Organization or group looking to raise more profits for your school or your child's school organization or club? Is your church looking for a new way to help the youth group raise money? Or maybe you have a great gathering place for kids, but your church needs a little something special to add to its recreation center or coffee shop. are your answer to all the above questions and more! ChillyFruit specializes in the following programs: fundraising such as school fundraising, school profit programs, frozen drink machine leasing, restaurant equipment leases, frozen drinks, children's fundraising, cafeteria profit program, business profit programs, equipment placement programs, upcharge programs (or up-charge program), convenience store leasing, family fun centers, family fun center refreshments, carnivals, school carnivals, concession equipment, restaurant equipment leasing, concessions for kids, football games, soccer games, little league, baseball games, pta, pto, parent teacher organizations, church, church functions. We have great fundraising ideas! 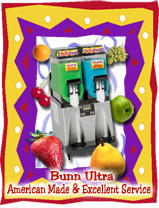 ChillyFruit (a division of YouNeedADrink.com, Inc..) represents several manufacturers of frozen drink machines (also called a margarita machine or a granita machine, slush machine or smoothie machines). Our preferred machine is Bunn Ultra I or Bunn Ultra II for our lease programs because they are American Made and have an EXCELLENT service network that is NATIONWIDE. Some of the other makers are Faby, Carpigiani,Crathco, Wilch, Grindmaster, Cecilware, Taylor, Saniserv, Coldelite, Stoelting. If you need a smoothie machine, slush machine, slushee machine , daiquiri maker, margarita machines, or frozen cocktail machines we will be glad to help you! We have ChillyFruit® that is Kid oriented. We do a lot of business with schools and school cafeterias. Parents and children love our fruity flavors and parents and teachers love the profits! ChillyFruit® and YouNeedADrink.com, Inc. also sells to catering companies, bars, restaurants and other adult oriented places of business. ChillyFruit® and YouNeedADrink.com also has frozen drink machine rentals, margarita machine rentals and granita machine sales, frozen drink machine repairs and margarita machine maintenance. Other services that ChillyFruit and YouNeedADrink.com offer are party, wedding, catering, restaurant, restaurant equipment, frozen fun, sno cone machine, snow cone machines, frozen drink machine repair and maintenance services. Since we have been doing this for quite some time, it was only natural to branch off and create ChillyFruit for companies who want to lease frozen drink equipment for their businesses. So when you rent a margarita machine from ChillyFruit® or YouNeedADrink.com for your next kid's party or adult's birthday party, you can order ChillyFruit mix and our other "adult type cocktail" frozen drinks under the name of YouNeedADrink.com. Yes, we do have adult drinks too! This will give you an idea of the differences in YouNeedADrink.com and ChillyFruit® products: Some of the frozen drink mix Flavors that YouNeedADrink.com carries are bar and cocktail mix like margaritas, strawberry margaritas, daiquiris,strawberry daiquiri, peach daiquiri, banana daiquiri, peach bellinis, hurricanes, lemonade, pina colada, rum runner, mai tai, blue hawaii and other cocktail mixes. ChillyFruit® and YouNeedADrink.com also carry mixes for Cappuccinos, frozen cappuccinos, frozen white chocolate, frozen mocha, frozen french vanilla are the "frappuccino" type frozen coffee drinks we offer. ChillyFruit® carries smoothie or slush type frozen drink mix flavors such as lemonade, pink lemonade, cherry, white cherry, berry punch, sour apple, cherry limeade, blue raspberry, banana, tropical blue or blue coconut, strawberry banana, strawberry, strawberry kiwi, watermelon, orange mango, black cherry, orange, grape punch and peach. You can order the smoothie mix with 20% fruit juice. These frozen drink products can be used as a kid's drink, without liquor, or as a cocktail base for a frozen alcoholic beverage drink. We are located in Tennessee, but we are a NATIONWIDE program. The Tennessee cities and areas we serve are,Nashville, Metro Nashville, Clarksville, Murfreesboro, Franklin, Brentwood, Hendersonville, Antioch, Gallatin, Lebanon, Goodlettsville, Goodlettesville, Columbia, Spring Hill, Triune, Dickson, Burns, Springfield, White House, Smyrna, Lavergne, Donelson, Green Hills, Bellevue, Belle Meade, West Meade, West End, Vanderbilt and Mount Pleasant, TN. The counties in TN we serve are Williamson County, Davidson County, Rutherford County, Maury County, Sumner County, Montgomery County, Wilson County and other Middle Tennessee Counties. If you don't see your county or city listed here, email us or call us and we will make sure you are represented! associated art are registered trademarks of YouNeedADrink.com, Inc.